The Facts About Bull Sharks In Freshwater - We Love Sharks! The Facts About Bull Sharks In Freshwater - We Love Sharks! 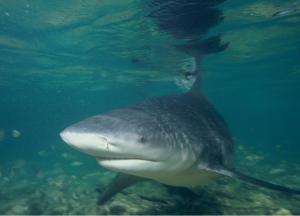 Along with its close relatives the tiger shark and the great white shark, the bull shark has been linked with the most number of documented shark attacks involving humans. These three shark species plus the oceanic white tip are usually regarded as the most dangerous sharks to humans worldwide. But, the bull shark has a particular behavior that makes it prone to encounter people more often. It frequents rivers, shallow waters and other bodies of freshwater. Basically, the kind of water bodies human beings enter most often. Even great white sharks are not known to inhabit freshwater. The bull shark, carcharhinus leucascomes, is so named because of its stocky shape, broad and rounded flat snout, and seemingly aggressive, unpredictable behavior. As a result of these characteristics, many experts have come to believe that they may even be the most dangerous shark species on earth. However, though these fish do come in close proximity to humans, actual statistics still show that your chances of suffering a shark attack are extremely slim. For instance, lightning kills about 41 people in coastal American states annually as compared to less than one human death from shark attacks every couple of years. But how is it that bull sharks are able to switch so easily from saltwater to freshwater and back? This kind of environment change would be deadly to most other shark species. Here’s what scientists have found out about the special survival properties of bull sharks in freshwater. The average shark must retain salt in its body to survive. If not, its cells will rupture causing bloating and subsequent death. For this reason, most sharks will not enter fresh water. Even if they do, they return to saltwater quickly if not their internal salt levels would become diluted. When they are placed in freshwater for extended periods of time, they’ll absorb too much water and lose too much salt concentration to stay alive. In summary, they can’t adapt to freshwater. Now, both freshwater and saltwater fish are able to live in their various watery environments because of a process called osmoregulation. Osmoregulation happens when an organism is able to maintain a constant concentration of water in its body. Such an organism will maintain that concentration despite being in an environment that would normally cause it to lose or gain water. However, the bull sharks have somehow developed a special kind of osmoregulation whereby their kidneys recycle the salt content within their bodies. Also, they have special glands near their tails that aid in salt retention. This special adaptation allows them to ‘regulate’ themselves and live successfully in a broad range of water salinity. They can thrive in freshwater bodies, brackish water, or salt water. This property becomes more pronounced as the bull shark ages. Therefore, you will find the majority of younger bull sharks in freshwater while the older bulls frequent saltwater areas. Baby bull sharks are born in shallow, fresh/brackish water and though theoretically they can remain there for life, they will leave at some point. Bull sharks of reproductive age leave these waters for the sea in order to mate. It also appears the bull sharks have a clever strategy behind having their nurseries in freshwater. Other predatory shark species that may want to feed on bull shark young will not enter those areas. Thus, the freshwater becomes a protective region where bull shark young can grow safely till they are mature enough to venture out. Some Cases Of Mistaken Identity? For the fact that bull sharks frequent the same kind of waters that most casual bathers and swimmers like to stay in, it’s necessary to take some precautions when you’re in such places. In addition, bull sharks are known for their almost zero tolerance for provocation. After understanding the amazing survival ability of bull sharks in freshwater, experts now believe that bull sharks, rather than great whites, may have actually been responsible for the Jersey Shore shark attacks of 1916. These attacks were the inspiration for the movie Jaws and they happened in brackish/freshwater. Bull sharks were also later implicated for biting swimmers around the Sydney Harbour inlets though the great whites were the original suspects. Bull sharks and possibly sand tiger sharks have bitten several people in the murky waters of the Ganges River in India. The critically endangered Ganges shark was originally blamed for those bites. Other sightings of bull sharks in freshwater include shallow parts of the Amazon River, Lake Nicaragua, and areas off the Coast of Florida. Also, some have been seen as far up the Mississippi River as Illinois and a few very rare sightings in Lake Michigan. They prefer to feed in murky waters and though they have excellent eyesight, they may decide to ‘investigate’ a human foot as potential prey by using their teeth. Of course, such bites no matter how gentle could be fatal for humans. Note that people have been attacked while standing or wading in waist-deep water. It’s not advisable to swim or wade through murky water especially where there’s a lot of fish bait or general fishing activity going on around you. Pregnant female bull sharks in particular move around extensively in freshwater looking for a safe place to deliver their pups. They would be quite defensive and would easily regard humans as intruders. Despite their aggressive reputation, bull sharks often display docile behavior in some environments. For example, in the Bahamas divers frequently interact with groups of bull sharks without incidents. Could this be because the waters in those places are very clear and the sharks can see clearly that these are humans and not their typical prey? Whatever the case may be, these are wild animals looking for food and breeding grounds, etc. We can take some basic precautions that will limit the incidents of attacks from bull sharks in freshwater.